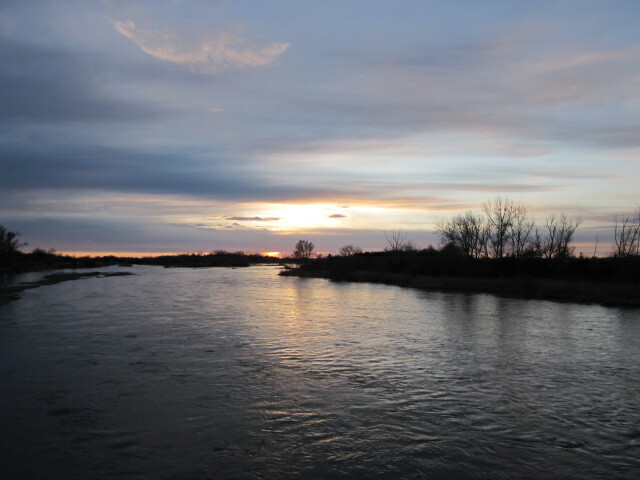 In the shallows of the Platte River, Nebraska, it’s standing room only. 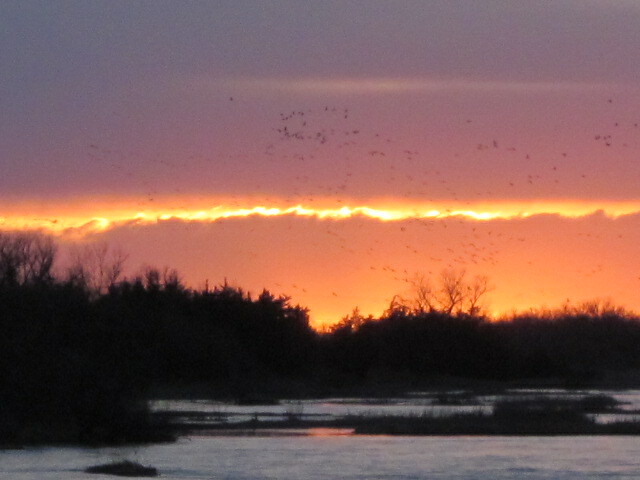 Sandhill cranes pack the sandbars solid in front of our observation blind at Rowe Sanctuary, Kearney, Nebraska. The far shore is lined a dozen thick. This is their favorite roosting position- 6 inches of shallow, slow-moving water that is surrounded by deep water. It keeps the predators away. We’ve come to this quiet corner of Nebraska to experience the cranes’ spring migration as they funnel onto the Platte along the Central Flyway from points south. The best way to do that is to participate in a guided blind tour, scheduled every daybreak and sunset while the cranes are migrating. People move around the inside of the blind, peer out the holes, look up and down the river, and watch the east where the sunrise is painting color into the sky. We whisper in hushed voices, as if in a church. I settle at a corner window and rest my head, bend my ears outward to amplify the sound. It sounds like a crowd cheering. Their calls can be heard 2-3 miles away, made possible by their exceptionally long trachea. The extra length resonates much like the tubing in a trombone and helps project the vocalizations. The music of the crane’s bulging is constant. We listen for a change in pitch, an increase in intensity that signals they are about to lift off in search of a meal. Before I arrived, it was difficult to imagine half a million elegant, prehistoric-looking birds flying, gathering, bugleing and dancing their mating dance. Words cannot describe the sheer volume of their numbers, with their 5-6 foot wingspan. But it is the sound that knocks you- the intensity and volume of their musical voices. I could never tire of it. 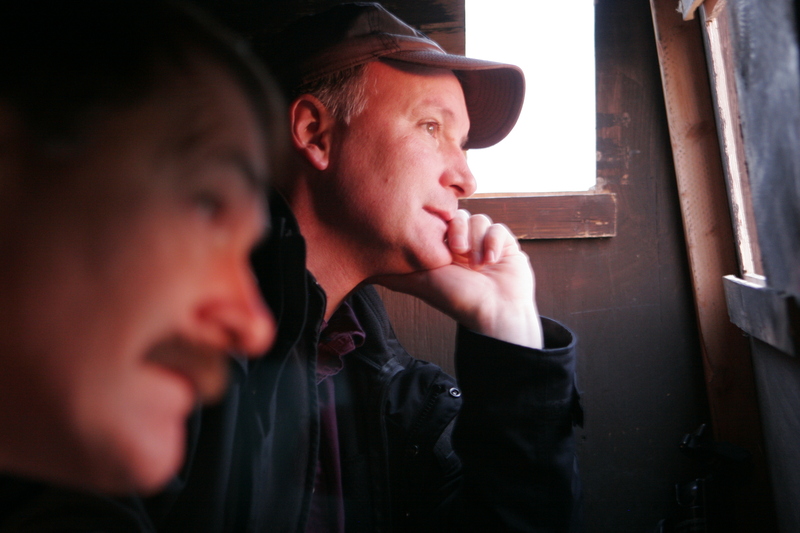 The Sanctuary operates the Iain Nicholson Audubon Center which is famous for its guided blind tours, scheduled every daybreak and sunset while the cranes are migrating. There are 2-3 blinds available for guests that fit 20-25 people. The blinds look like long wooden boxes with many holes facing the river to observe and photograph through. For 6 weeks during migration, tours are booked solid. A typical field trip begins and ends with a ¼-1/2 mile walk to the blind. In the mornings, it is held under the cover of darkness to prevent spooking. 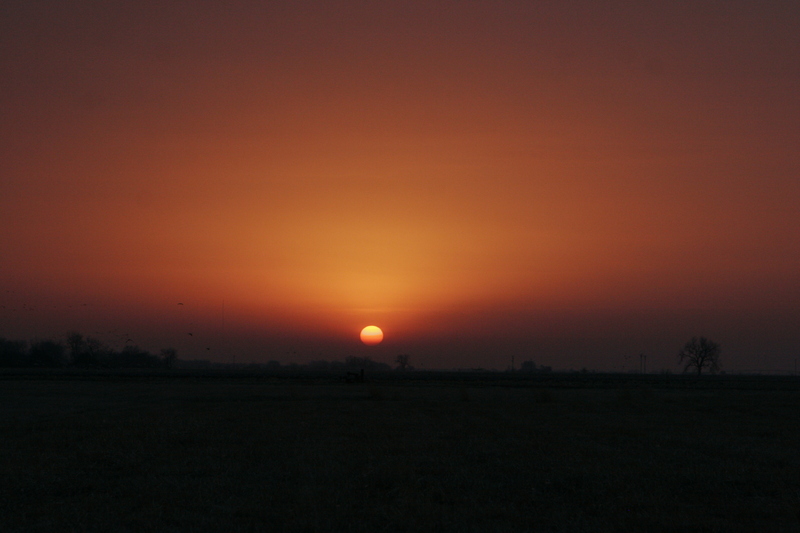 In the evening, you depart before sunset and view the cranes as they come in. The tours last approximately two hours. Volunteer guides educate visitors on the behavior of the cranes so we get to know this amazing bird more intimately. Some fans cannot get enough, a brief visit is too fleeting. Volunteers come from all over the U. S. and Canada every March to spend multiple weeks immersed in the cranes, helping to insure that their future remains a reality. At one time, there were 200 river miles available for suitable roosting, but now the cranes are down to 40-50. 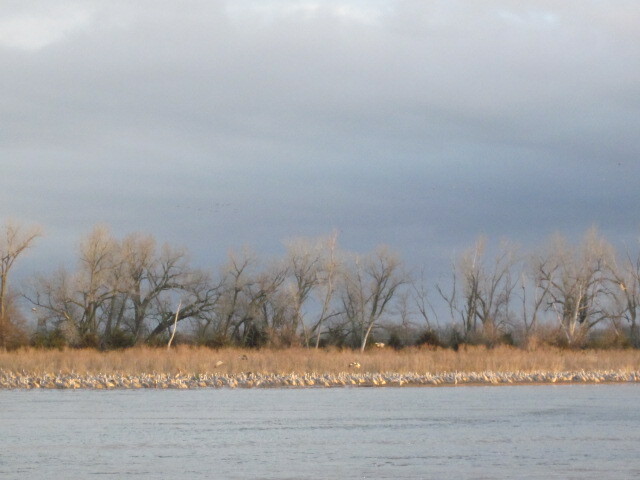 Areas of the Platte are now managed for the sandhill cranes, by organizations like Audubon and the nearby Crane Trust, who also operates other viewing sites. They plow, till and work about five acres of land to create prime habitat for the cranes to roost. The islands and surrounding banks are graded and prepared, tilled with a tractor and even sprayed with insecticides. Fortunately, these procedures did not have to be executed in the last few years, because of the extensive ice jams. They acted like glaciers, scouring and cleaning the river and sandbars free of frangipani, an invasive grass. As we observed this morning, sandhill cranes need open sandbars and banks in which to roost safely and confidently. They must be very careful how they manage the cranes for they have stopped coming everywhere except for this stretch. The birds scare easily and there are high power lines overhead that they can fly into and die very quickly. On any given day, 90% of the cranes can be found within a 3-8 mile radius of the river, traveling an average of 6 miles per day. They load up on essential nutrients and calories to sustain them for the final push ahead, to give birth and raise their young. They build up fat reserves, adding at least 18-20% to their body weight. The cranes eat waste corn found on the ground in the surrounding fields, which makes up 80% of their diet. They also find worms, insect larvae, snails and other invertebrates found in the wet meadows adjacent to the river. 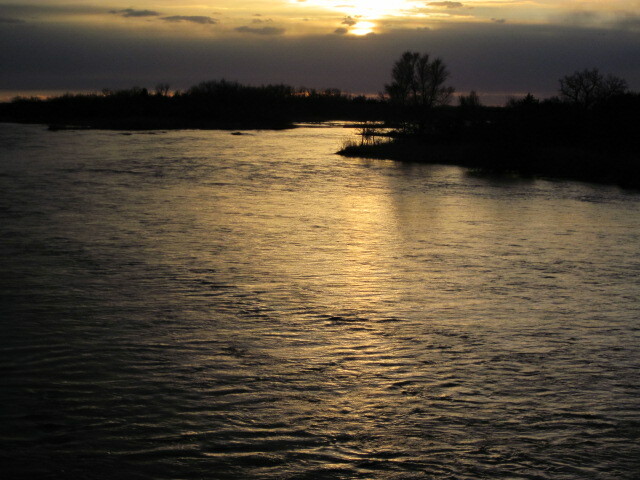 The Platte River Basin is the only ecosystem along the migration route that meets all their requirements for roosting, resting and restoring themselves. Predators include power and transmission lines, coyotes, bobcats, domestic dog, great horned owls and eagles. We don’t want to add insensitive humans to that list. Disturbances during their critical stay in Nebraska can cause the birds to leave in poor condition, jeopardizing reproductive success when they arrive on their northern nesting grounds. When the cranes come into an area to feed, they drop their feet as if they are coming in for a landing, like a parachuter, with their great 5-6 foot wingspan. Besides eating, the cranes do a lot of dancing. They are considered the most accomplished dancers in the animal kingdom. Their dance includes head bobbing, bowing, arching, jumping, (as high as 5 feet), wing flapping, running and twig tossing. The cranes leap into the air, kick up their feet, turn in the air like a tour-jete’ in ballet. They also do minuets as they rotate gracefully with extended wings. Many African tribes have incorporated some of these moves into their ceremonies. Rivals dance to access one another and dancing facilitates pair bonding. But dancing is not solely reserved for mating purposes. Pre-adult cranes practice dancing for years before they select a mate. Parents educate their young chicks by dancing with them. Dancing can simply be a display of high-spiritedness, play, or even joy. A red patch on their head that is actually bare skin, changes in shape and size depending on their mood. Cranes are very skittish and will take flight at any disturbance. Its best to not approach cranes on foot while they are in the fields so we use our car as a blind. It is March 23rd and the cranes will be thinking of leaving soon. By April 15th, they will all be gone. The cranes will spread out like an hourglass and head north, shooting for points in the Arctic, Siberia, and Canada. In the past 6 years, folks from 50 countries have come to witness the sandhill crane migration, knowing this happens nowhere else on earth. It is truly one of the greatest spectacles of the natural world. Volunteer Phil Mesner of Victoria, Columbia, is well aware of this. 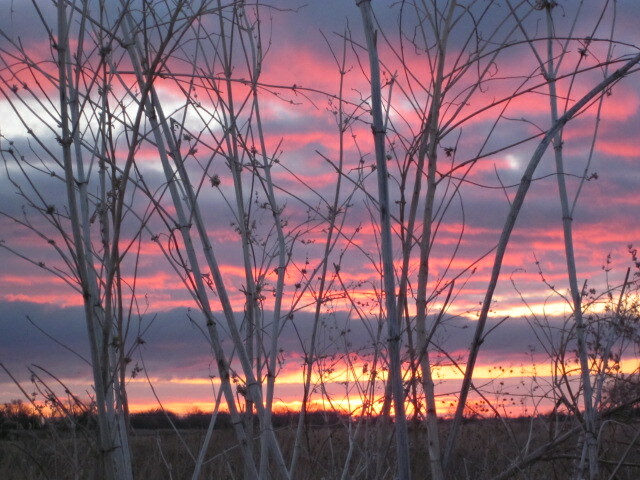 What more of a reason do we need to come to central Nebraska this spring than witness this remarkable gift of nature? The best time for viewing generally, is mid to late March. Previous Learning to Make a Living – at 12 & 14 Years Old!